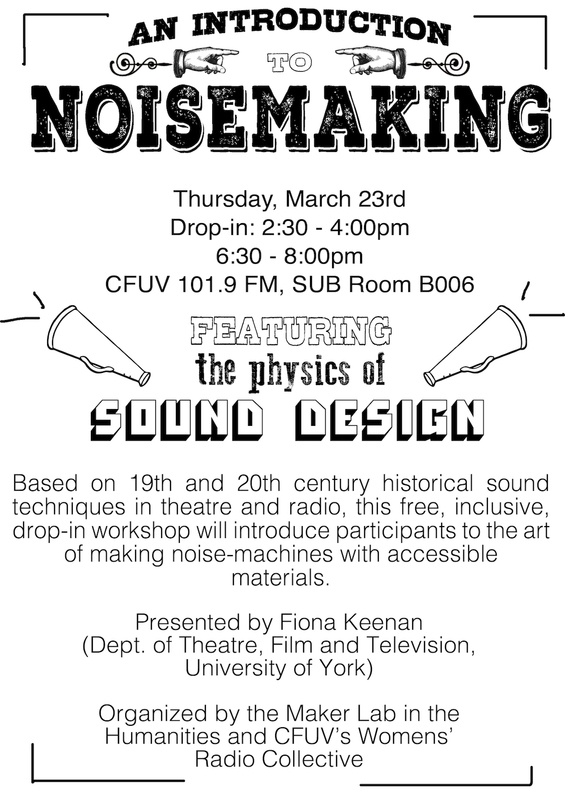 The MLab and CFUV’s Women’s Radio Collective are hosting a workshop on DIY noisemaking this Thursday, March 23rd. The workshop will be facilitated by the MLab’s visiting PhD researcher, Fiona Keenan, and is open to everyone over two sessions on an informal, drop-in basis. The workshop is free to attend, and no experience is required. It is inclusive to self-identified women and non-binary or gender-fluid people. About the workshop: Drawing from historical techniques in theatre and radio from the 19th and early 20th century, the workshop will focus on making low-tech noise machines with accessible materials as a way to explore the relationship between everyday objects and sound production. Throughout the day, we’ll also make recordings of everyone’s noise projects to contribute to a collaborative audio piece. If possible, everyone is encouraged to bring along an empty tin can (any size) to the workshop to make sure we have enough materials to go around. Also on Thursday, tune into CFUV 101.9 FM for a special interview with Fiona airing on the Women’s Radio Collective program, Big Broadcast, at 8pm. About Fiona: Fiona Keenan is a sound researcher and noisemaker, working primarily in systems for live sound performance. These systems include handbuilt electronics, mechanical sound producers, sound props, and software. Fiona completed an MSc in Sound Design at the University of Edinburgh in 2013 and is currently enrolled as a PhD student at the Department of Theatre, Film, Television and Interactive Media at the University of York. Learn and listen at ftkeenan.wordpress.com. Post by Teddie Brock, attached to the Makerspace project, with the news and fabrication tags. Featured image and poster care of Fiona Keenan.